I’m a hot beverage fiend. Tea, coffee, even just plain hot water…I’ll take it. So, naturally, I’m a big fan of any treats that pair well with these beverages! Cue the Biscotti. Just as an FYI, these make an awesome Holiday gift, lending to their festive colors! 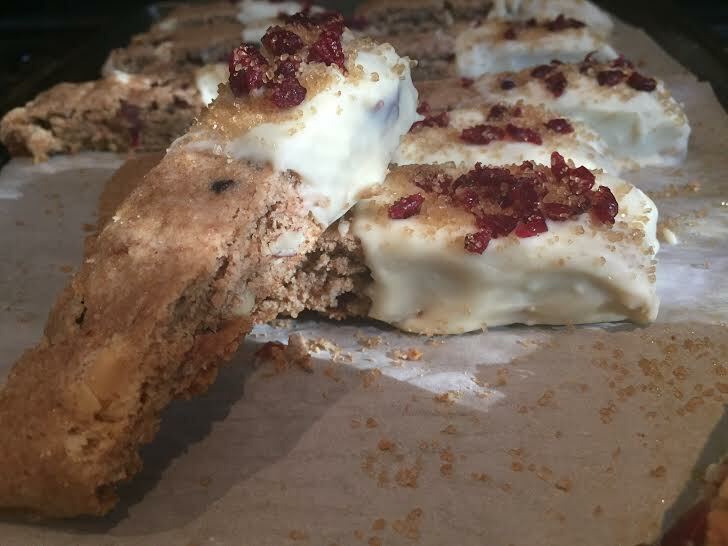 * Dip half of your biscotti in the white chocolate. Garnish with chopped craisins and a sprinkle turbinado sugar. Mix your flour, baking powder, and salt in oil bowl. In another bowl, mix your oil, sugar, vanilla extract, and eggs. After thoroughly mixed, fold in your craisins, almonds, and white chocolate chips. Slowly add your flour mixture, mixing as you pour. I generally start with a fork and finish off mixing with my hands. Chill your dough in the refrigerator for roughly ten minutes. Line two baking sheets with parchment paper then spray with non-stick spray. Take half of your dough and place on one baking sheet. Place the second half on the other. Form each dough ball into a long, rounded log. They will bake outwards, so the log shape will help to give the biscotti their trademark shape. Bake the dough for approximately 34-36 minutes, or until the bottom edge is lightly golden. Take your baking sheets out of the oven and leave to cool, roughly 10-15 minutes. Reduce your oven to 275° while your biscotti cool. You will now cut your biscotti horizontally, to give you long slices. I used a long bread knife. Start on one end and lean into the knife. Try not to saw through to avoid cracking the cookie. Lay your sliced biscotti several inches apart and bake for another 10-12 minutes. You can either enjoy your biscotti once they cooled, or you can sexify them a little bit! I dipped half in white chocolate, then garnished with chopped craisins and raw turbinado sugar. Enjoy :). Reblogged this on COMMITING CARBOCIDE .